I think it has to do with the unfortunate statistically predictable occurrence of fire, and the fact that landslides of this magnitude and number are rare. That being said, our County team, mostly centered in the Public works Dept. are exploring every avenue. We’ve gone or sent a variety of folks out to Dobbyn Creek, including Fish and Game, County Environmental Engineering, Roads, Bridges, and more. Hank Seemann from Public Works was out with NRCS on Thursday 4/14, and they’re exploring restoration funding opportunities. Others too. The State disaster declaration…is better news, but typically only covers county expense (but, of course, we hire local folks so that helps some). We’re going to do everything we can and leverage anything received as far as we legally can to help, recognizing that teamwork between locals, property owners, county, and other agencies is going to be essential for events of this magnitude. I asked Diana [Totten] yesterday morning if she would be game to hike me in to Fish Creek and any other sites so I could see and record other damage. I want us to keep the totality of these events in mind, and while recognizing that available funding is scarce, and that there are high thresholds to meet, make sure we’ve explored everything. Along with that, we at the county remain open to suggestions, and the good work and communication from Kristina Laskar, Diana Totten, and many, many others is essential. 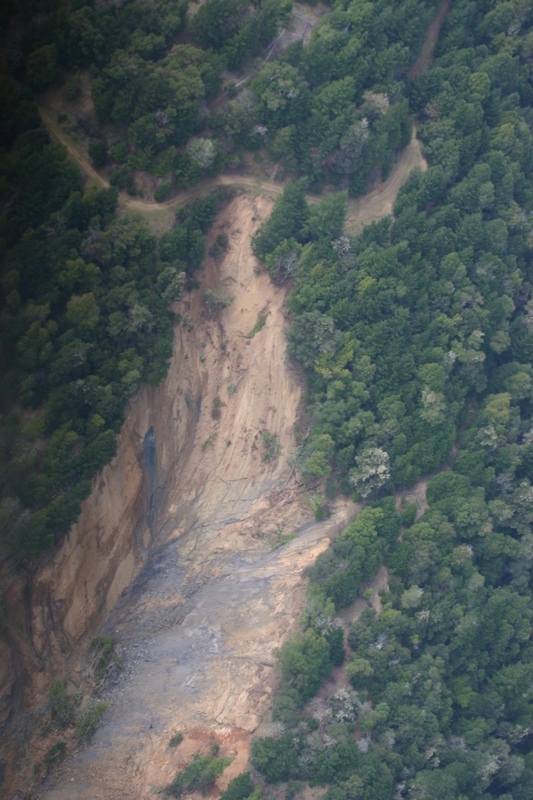 Whether the emergency declaration of Governor Brown yesterday will help with the Dobbyn Creek slide remains to be seen as it is on private property. It does however affect the county road and the waterways. It is a Salmon and Steelhead spawning area. This photo below was taken not long before the slide came down–it is of a spawned out salmon. 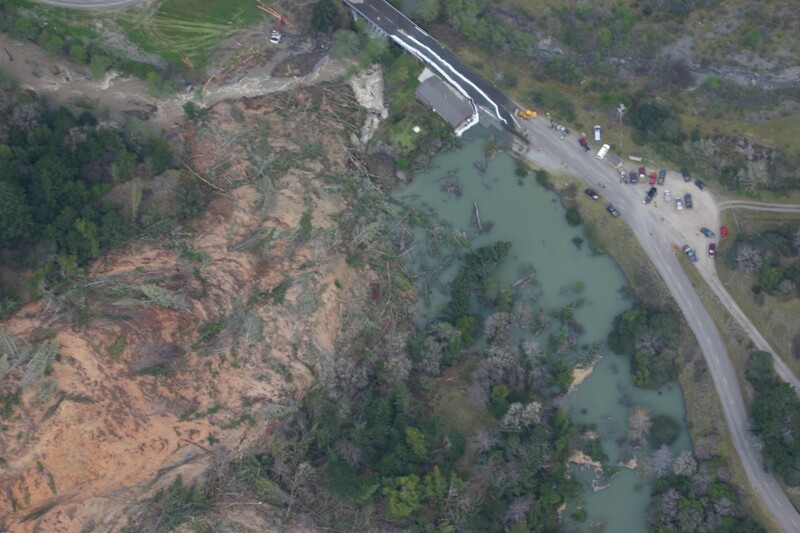 Photos taken a few days ago (April 5, 2011) were provided by Clif Clendenen from a public agency. Dobbyns slide update, even with the light rain the lake rose quite a bit, I was called to come back over at 11pm. At that time the lake was 10″ from over flow into culverts on county road. The crew had noticed a lot of changes in the natural spillway through the logs and mud. There was a shift underground and the lake level stopped rising at that point. I left the slide at 3am and the crew gave an update at 7am that a lot of erosion is taking place on the dam, yet the water level remains about the same. This could be good news as long as it erodes slowly, if the dam broke away all at once it would be very damaging. This entry was posted in Landslides and tagged Clif Clendenen, Diana Totten, Dobbyn Creek, Kristina Laskar, Kym Kemp, landslide, photos. Bookmark the permalink.